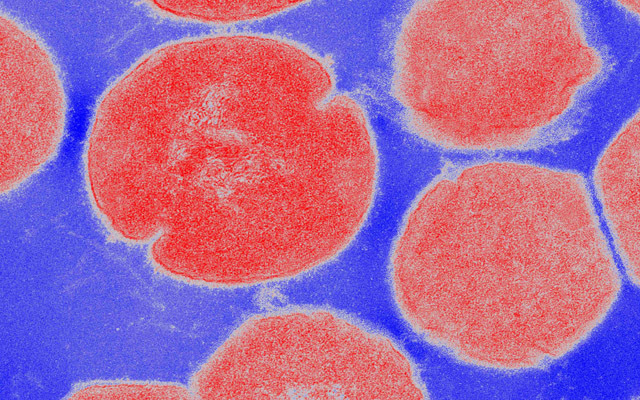 Group A Streptococcus bacteria (red) coat their surfaces with M1 proteins (white), which “stiff-arm” natural antibiotics produced by the human body. The most severe Group A Streptococcus (strep) infections are often the work of one particularly nefarious strain known as M1T1, named in part for the type of tentacle-like M protein projecting from the bacterium’s surface. While many previous studies proposed ways M1 might contribute to strep virulence, researchers at University of California, San Diego School of Medicine and Skaggs School of Pharmacy and Pharmaceutical Sciences have uncovered a new explanation that may trump all others: M1’s ability to hold off antimicrobial peptides — natural antibiotics that comprise one of the immune system’s front lines of defense. The study, published October 14 by Cell Host & Microbe, underscores the importance of antimicrobial peptides and hints at a new therapeutic approach to helping the immune system get a leg up on this crafty pathogen. Group A strep is responsible for more than 700 million infections worldwide each year, most notably strep throat and “flesh-eating” skin infections. In response to strep and other bacterial infections, the body unleashes small antimicrobial peptides. These short chains of amino acids are lethal to bacteria in several ways — for example, by poking holes in bacterial membranes and by summoning reinforcements in the form of infection-fighting cells. Nizet’s team examined M1 strep’s ability to resist killing by one critical antimicrobial peptide called cathelicidin. They found that Group A strep lacking M1 protein were easily killed by cathelicidin, but were rescued when they were armed with added M1 protein. What’s more, in a mouse model of M1 strep skin infection, it didn’t matter if cathelicidin was present or not — the bacteria were just as virulent either way. In contrast, M49, a less virulent strain of strep, caused larger skin lesions in mice lacking cathelicidin than in normal, cathelicidin-producing mice. This suggests that M49 is unable to stiff-arm antimicrobial peptides the way M1 can, making the immune response more effective and the M49 bacteria less virulent. Other research groups previously reported that the M1 protein contributes to strep virulence because it makes it harder for immune cells to engulf the bacteria, or bind and inhibit other components of the immune system, such as antibodies. While those factors may apply to all Group A strep bacteria, it may be M1’s ability to keep antimicrobial peptides at bay that makes strains with this version of M protein so deadly. The findings underscore the need to fortify or optimize antimicrobial peptides in order to improve the immune system’s odds of successfully fending off an infection, Nizet said. Understanding the interaction between M1 and antimicrobial peptides also provides a potential new approach to treating Group A strep infections. “It’s conceivable that we could find a drug that breaks the M1-antimicrobial peptide connection, unlocking the immune system’s ability to fight the infection on its own,” said first author Christopher LaRock, PhD, a postdoctoral researcher in Nizet’s lab. Co-authors of this study include Simon Döhrmann, Jordan Todd, Ross Corriden, Joshua Olson, Richard L. Gallo, Partho Ghosh, UC San Diego; Timo Johannssen, Max Planck Institute of Colloids and Interfaces; Bernd Lepenies, Max Planck Institute of Colloids and Interfaces and Freie Universität Berlin. This research was funded, in part, by the National Institute of Allergy and Infectious Diseases, part of the National Institutes of Health (grants AI052453, AI096837 and AI077780), A.P. Giannini Foundation and German Academic Exchange Service.